All of our self catering holiday cottage accommodation is in Broad Haven and Little Haven which are located on St Bride's Bay in the west of Pembrokeshire. The quiet village is ideally situated for exploring the craggy coastline of West Wales as well as many of the fantastic tourist attractions in the area. The county town of Haverfordwest is only six miles away. Also close by, and well worth a visit, is Britain's smallest city, St Davids, home to the famous cathedral. Broad Haven has all the facilities you need to enjoy a holiday including a well equipped shop, a lively Baptist Church, the welcoming Galleon Inn, the Ocean Care/Bar/Restaurant as well as the great Bay Cafe serving wonderful meals and snacks, The Beach Shop selling all you need (and more) for a fab day on the beach and even a Surf Shop for you sporties. A lovely nature boardwalk can also be found just off the carpark in Marine Road and although the village is located in the unspoilt Pembrokeshire National Park you have all the shopping comforts of home right on your doorstep. In the village, within 3 minutes walk of the cottages, there is a very well stocked Londis store which has everything from fresh bread to newspapers and a large range of grocery supplies and the brand new Treatment Room will be opening above The Bay Cafe in June. Little Haven boasts 3 village pubs, The Castle Inn, The Swan and The St Brides. It also has Captain Morgans Cafe serving meals, snacks and ice-cream throughout the day. You can take short walk from village to village either across the beach when the tide is out or over the hill. In Haverfordwest (about six miles away) there is a large Tesco Extra Superstore which is open from 6am to 12am Monday to Saturday and from 10am to 4pm on Sunday. Also in Haverfordwest there is a large shopping area in the town centre as well as several retail parks. From the M4 junction 49 take the A48/A40 to Haverfordwest. 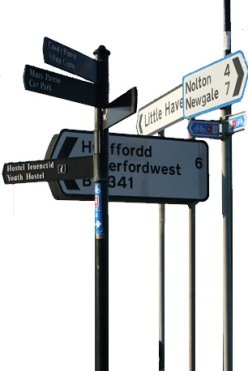 Follow the signs for Broad Haven (B4341) from Haverfordwest and after approx. 6 miles you will enter the village of Broad Haven. Little Haven is then just along the sea front and over the hill.